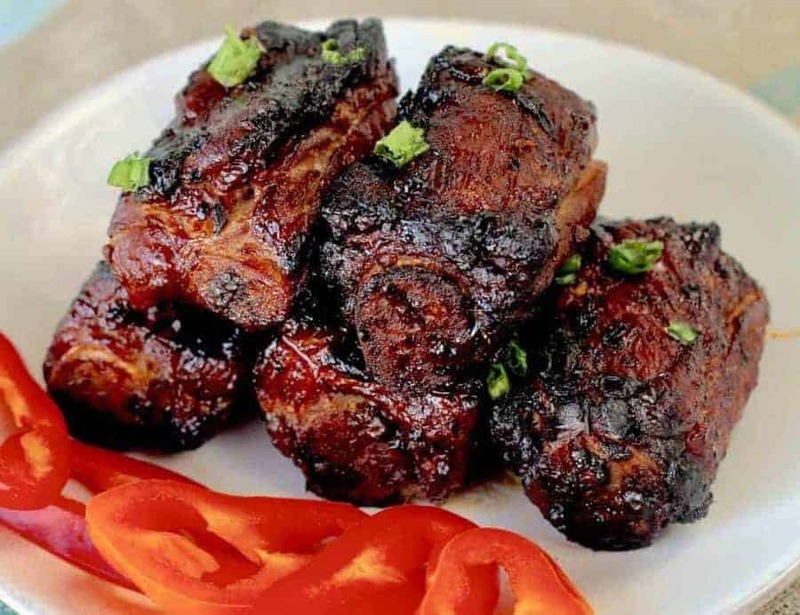 Air Fryer Keto Chinese-style spareribs use black bean sauce, and a few other classic Chinese ingredients to give you finger-licking ribs that are just perfectly tender and chewy at the same time. Once they’re marinated, they cook in under 10 minutes in your air fryer or convection oven. So I was making these braised Chinese spareribs where I was basically throwing things together in a pot and lo and behold! They actually turned out to be quite tasty. I had set aside half the ribs to make them a little crispy and crunchy in an air fryer. The marinade for the Instant Pot ribs smelled SO good, that I decided I’d use a similar thing for the air fryer ribs. I had to mess with the proportions to get a rich, thick sauce that would coat these ribs a bit more. 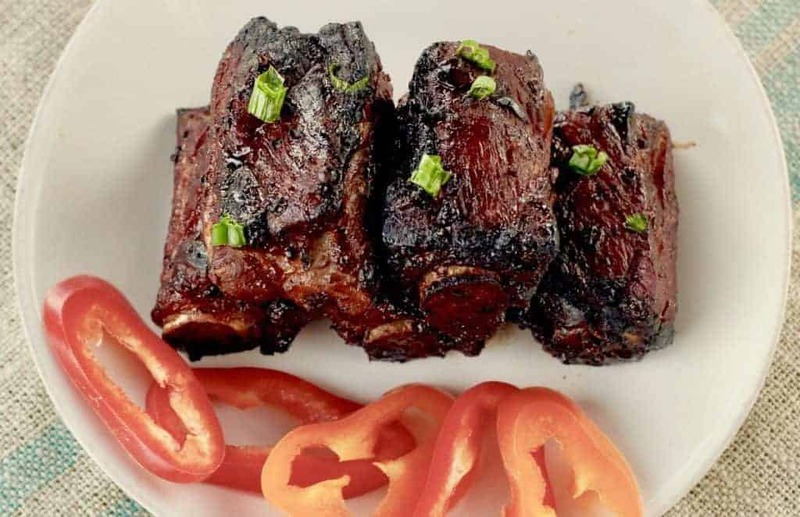 But it was a simple, fast marinade, and at the end of a ten-minute cook time, I had these Chinese-style spareribs. All in all it’s definitely a recipe I would make again and again, and my family agrees! I call them Chinese-style because the flavor profile and the ingredients are very typical of some areas of China. Either way, I hope you’ll call them delicious! If you try them, let me know in the comments what you thought about them – I love getting feedback! 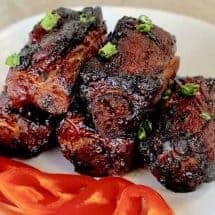 Air Fryer Keto Chinese-style spareribs use black bean sauce, and a few other classic Chinese ingredients to give you finger-licking ribs that are just perfectly tender and chewy at the same time. Once they're marinated, they cook in under 10 minutes in your air fryer or convection oven. In a large mixing bowl, stir together all ingredients for the marinade. Add the spare ribs and mix well. Allow the ribs to marinade for at least 30 minutes or up to 24 hours. When you're ready to cook the ribs, remove the ribs from the marinade and place into the air fryer basket. Set the air fryer at 375F for 8 minutes. Check to ensure the ribs have an internal temperature of 165F before serving. I just made these, and while the flavour is great, they did not look at all like the photograph, and took significantly longer to cook to the required colour. As I said they were very tasty – my wife is insisting I continue cooking them until I get it right! If you have time can you tell us what you think are the best type of recipes for the instant pot versus the Air fryer. I just received my Instant Pot and am curious about the Air fryer. The airfryer is fantastic for fattier cuts of meat with marbling. Leaner meats do better in the Instant pot IMHO. They require the steam, the wet heat and the higher temperatures to break down the meat fibers. 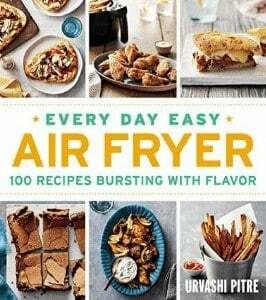 The airfryer is fast in its own way. It crisps things absolutely beautifully including chicken wings, pork shoulder etc. But I do think it dries out lean pork, chicken breast etc a little bit.